Pastor James Garnett was raised in central Arkansas. He joined the Navy and was stationed aboard a nuclear submarine, and a destroyer. After naval service, he worked for the US Postal Service for 15 years. He was a Postmaster in the small communities of Marcella, Sidney, Adona, and Paron, Arkansas. He moved to Saint Louis, Missouri in order to attend Concordia Seminary. He graduated with a Master of Divinity and was ordained as a pastor in February of 2015. 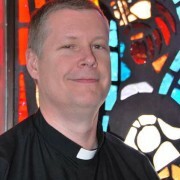 He served the saints at Lutheran Church of the Good Shepherd in Biloxi as a vicar from March 2014 until his ordination in 2015. Pastor James is married to Ellen, and has two grown daughters, Kimberly and Krystal. He and Ellen have three grandsons, Damian, Cameron, and Domingo. James and Ellen are certified Resource Parents for the state of Mississippi and have been blessed to care for several children in the state foster care program.